INSTRUCTORS YOU CAN COUNT ON, RESULTS YOU CAN SEE. Kasia is a certified personal trainer and certified group fitness instructor by the Athletics and Fitness Association of America (AFAA). She has held group fitness certifications in Kickboxing, Step, Resistance Ball, Strong, Reaction Cycling, Keiser Cycling, and Yoga. She has taught group fitness classes for over 20 years. Kasia has worked with a wide range of ages from children to adults including local Boy Scout groups and elementary schools conducting boot camps and has instructed a variety of group fitness classes in health club settings including Bally's Total Fitness, LA Fitness, Life Time Fitness, Charter Fitness, and Body Tech Total Fitness. Kasia's ability to motivate others to reach their goals whether in a group fitness class or during personal training sessions is unsurpassed! 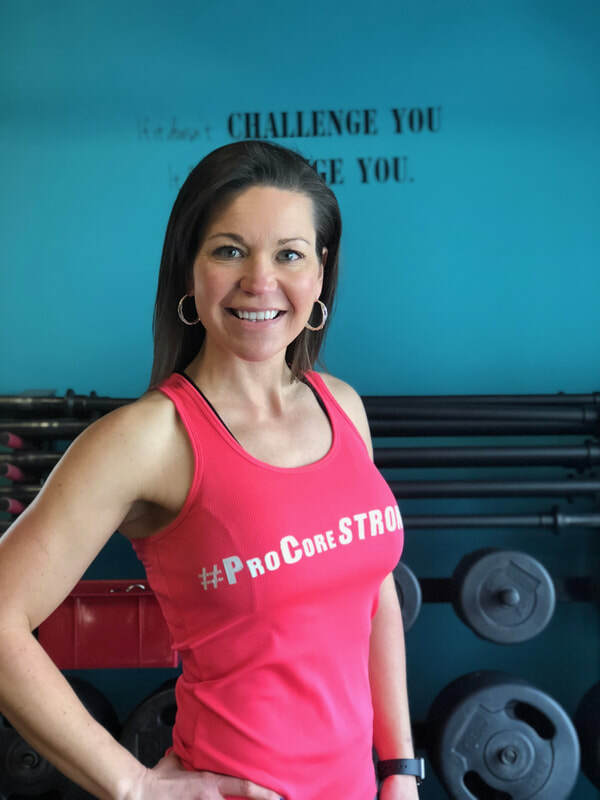 Carrie wears many hats including being a Registered Nurse, corporate workhorse, mother, friend, group fitness instructor, personal trainer, and co-founder of ProCoreFitness. Eight years ago, Carrie took her very first group fitness class. It was Kasia’s Adrenaline Rush Kickbox. Carrie was scared to death and if you were there you would find Carrie hidden in the back row, in the back corner, struggling to breathe, and holding onto the wall because she was so overweight, completely out of shape, and whimpering. But with consistency and seeing results, she was soon in the front row encouraging others and became a positive force in the class. Group fitness eventually turned into a fun hobby and let’s be real, working out alone can get totally boring, everyone needs someone to keep them going. Years later, Carrie is also now a certified Personal Trainer and teaches group fitness Strength based classes where you will find her emphasizing proper form and the occasional use of foul language. Carrie holds both her personal training and group fitness certification through the Athletics and Fitness Association of America (AFAA). She knows there are no limits and while wearing many different hats is fun, lifting many different weights is more satisfying. James is a 6 year veteran having served in the U.S. Army National Guard. His Military Occupational Specialty was with "M1A1 Abrams" aka BIG *SS tanks! As Squad Leader during his basic training, James is bringing his military experience to our newest Bootcamp class: Basic Training. James love of weights and strength training started in 3rd period gym class freshman year of high school. He ran varsity track but his gym teacher told him he was too skinny and needed to "hit the weights". His primary profession is in Social Services working with many different aspects including homeless veterans, the criminal justice population, substance abuse and women with children. James holds his certification through the Athletics and Fitness Association of America (AFAA) but most importantly he knows the 1st Step to any new path is the hardest and works with ALL fitness levels. Jake’s fitness journey began in his youth. He used to get teased about his weight at a young age, but after his first time seeing “Pumping Iron” with his soon to be idol Arnold Schwarzenegger, he found the inspiration and determination to turn things around. His life would never be the same, hitting the gym, reading every possible issue of FLEX Magazine he could get his hands on, and then went to work. That passion and drive for the fitness industry has never left him. The gym, or as he likes to call it “The Temple of Iron”, has always been a place of peace and solace in hard times. Jake has worked with clients from all age groups and walks of life including working with youth group training such as the Lincoln-Way Hockey association to clients in their 80’s! One of Jake’s biggest beliefs is that you should train your body as much as you train your mind. When not at ProCoreFitness you can find Jake at home reading, meditating, or watching documentaries. Jake also works at Protein Headquarters in New Lenox. If you have any questions regarding supplementation or diet Jake is very knowledgeable and always ready to share a plethora of information. Jake is here to help you reach your goals and keep you moving forward and always doing his best to put the “personal” in personal training. Jake is a certified personal trainer through NASM (National Academy of Sports Medicine). Amanda started her yoga practice just 5 years ago and views yoga as a journey of understanding the connection to the true self within. As an intention based teacher, she believes that the yoga practice should help one release layers of the ego to find a more authentic place internally, while cultivating strength in the body to calm the mind. Through work with the breath, the movement of the body, and letting go of incessant thoughts, Amanda communicates that one can find healing and inner strength. Amanda's classes are challenging, fun and allow for greater physical and spiritual development. She encourages students to discover more about the deeper layers of the self to initiate change, growth and healing in ones life. Ashley is a mother of two and has been an elementary special education teacher for the past 15 years. Her love for fitness began in 2010 when she started to learn firsthand what weight lifting and working out could do for her! While enduring different obstacles over the years with weight gain and surgeries she has learned how to fight for her fitness goals no matter what has been thrown at her physically and mentally. In 2016 she received certifications as a personal trainer by the National Academy of Sports Medicine (NASM) and group fitness instructor by the Aerobics and Fitness Association of America (AFAA). 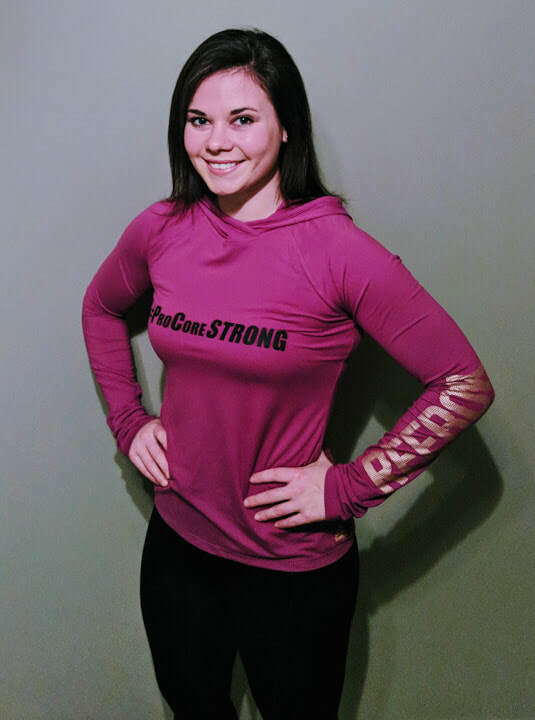 Ashley is very passionate about helping other women and men discover the awesome effects weight lifting and working out can have on their bodies, minds and soles, and how important and possible it is to NEVER GIVE UP! I am a mom of two awesome girls and I could not do what I do without my amazing and supportive husband. My love for health and fitness really kicked in when I became a mom. I am a Certified Personal Trainer through National Academy of Sports Medicine (NASM), Certified Group Instructor through Aerobics and Fitness Association of America (AFAA) and a Fitness Nutrition Specialist through NASM. My fitness background includes volley ball, swimming, and running. While I enjoy running, I really LOVE lifting weights and high intensity workouts, but you will catch me at a yoga class too. My focus is on building strength, along with improving flexibility, endurance and technique to build a functional, effective workout. Along with exercise, I am extremely passionate about nutrition. I really love cooking and baking! I could talk food all day. Healthy cooking, to me, is fun, easy and adventurous. I want to combine my exercise and nutrition knowledge to help others create a holistic real-life program. I love working alongside others and helping them achieve whatever their fitness and/or health goals may be. Alex is a Certified Group Fitness Instructor by the Athletics and Fitness Association of America (AFFA). Her fitness journey began at the early age of 5 years old, when her mother signed her up for her first swim class. There, she learned her love for athletics, and continued to competitively swim and play Water Polo, until she picked up distance running in her early college career. Alex is a five time Boston Marathon qualifier, and has also qualified for the USA National Triathlon. Her passion includes cardio respiratory endurance, and strength-based training. While Alex continues to be a fitness enthusiast, her main profession is in social services, where she is a Licensed Clinical Social Worker, and a Certified Alcohol and Other Drug Abuse Counselor. She has extensive experience with helping individuals struggling with substance use disorders, eating disorders, and mood disorders. She incorporates similar modalities in her fitness classes such focusing on the client’s strengths, and empowering individuals to push past their comfort zone. Alex is dedicated to helping you help yourself! Leslie has been teaching Group Fitness since 2000 and has certification from Athletics and Fitness Association of America (AFAA). She is a 3 time Chicago Marathoner, 1st Degree Black Belt in Songham Taekowndo, avid Stair Climber and loves to Spin. Leslie teaches a variety of classes including; Strength, Step, Tabata, Bootcamp, INSANITY and Spin. 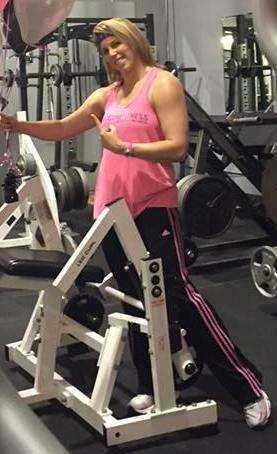 Her Group Fitness instruction over the years has been at Woman’s Workout World, Lady of America, The Oaks Mokena Park District, Tinley Park District and Slym Gym. She has also trained groups for Stair Climbs and Marathons as well. Leslie was the Race Director for “Running with Faith” 5K/10K from 2010-2017, starting the race from the ground up. Leslie currently is the Recess supervisor at St. Jude School in New Lenox- and the Kids LOVE HER! She teaches them Recess & that’s the Best Class! Being a Mom of 3 daughters has kept her busy as well as been married to her husband Jim for a long time……20+ years!!! Leslie’s class style – is work hard & have fun! NEVER has repeated the same class or choreography. Ya never know what you might expect! Life is way too short – so go out there & LIVE!!!! Jamie has always had a passion for dance and was able to blend it with fitness when she discovered Jazzercise. Jamie has been a certified Jazzercise Instructor for the past 21 years and has taught Dance Mixx, Interval, Strength, Core and Kickboxing formats. She also trained, evaluated and coached other instructors as a Jazzercise Quality Coordinator. Although she enjoys the provided Jazzercise choreography her love of creating her own routines led her to certify in group fitness from Athletics and Fitness Association of America (AFAA). Her main focus has been Hip Hop, she has led classes at Lifetime Fitness and a few Jazzercise locations. Jamie recently started taking classes at ProCore and immediately felt at home. She was thrilled that there is such an emphasis on strength training here and is excited to bring a new class to the mix. Outside of instructing fitness classes she is a wife and mother of 4 (ages 10-15). Jamie also has other creative outlets. She is employed at Ulta Beauty Corporate as a Production Design Manager. In her spare time she does hair, graphic design, and choreographs competition routines for high school dance teams. please contact us for opportunities!